Sir Arthur Conan Doyle is to blame for the troubles of George P. Macklin, 1924 Jackson avenue, Evanston, and for the death of Macklin’s dog. If Sir Arthur had not written “The Hound of the Baskervilles,” Macklin’s dog would not have appeared as an apparition to the children of Evanston, Walter Johnson’s 5-year-old son would not have been frightened into convulsions, Macklin would not have been arrested for maintaining a public nuisance, and the gigantic mastiff, which was his pet and pride, would still be guarding his backyard. 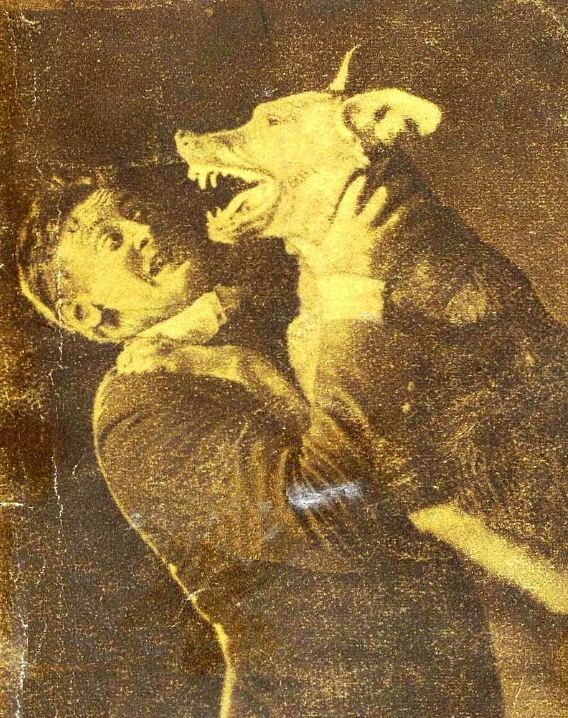 But since the author chose to write the tale and young Hermann McInturf, 1623 Jackson avenue, chose to read it, Macklin’s 175 pound mastiff’s face and jowl were smeared with phosphorescent paste, and it wandered around Evanston at night with its face literally lit up and glowing with ferocity. Now, in intellectual Evanston, they ought to know better than to believe in ghosts, but they don’t, and to the residents of the suburb, the mastiff became at once a phantom and a terror. University professors, fair co-eds, and brawny athletes fled at its approach, unmindful of the fact that it was wagging its tail. What wonder, then, that Walter Johnson’s 6-year-old child was frightened nearly into convulsions, and that his other children were unable to sleep in the dark? Johnson did not dare to tackle the phantom hound, but he believed that the law could tackle its owner. He went to a justice’s office to get a warrant for Macklin’s arrest. “What is the charge?” asked the magistrate. He was arrested and yesterday brought to trial. Then it was brought out that boys headed by McInturf, and not Macklin, were responsible for the transition of the mastiff from a watchdog to a ghostly animal. But Johnson did not relent. “Shoot the dog,” he demanded. Macklin was forced to comply, and now the animal that McInturf says he intended to make into another “hound of the Baskervilles” no longer disturbs Evanstonians by his nightly prowlings. The story was widely syndicated, usually in the form below, which gives some different details: a 6-year-old daughter instead of 5-year-old son who goes into convulsions and the police shooting the dog instead of Macklin being forced to do the job himself. Gigantic Mastiff Fixed Up as a “Ghost Dog” by Boys. George P. Macklin of 1894 Jackson boulevard, has lost his valuable mastiff because a number of boys in his neighborhood persisted in making a “ghost dog” of him. The mastiff, which was of gigantic size, weighed 180 pounds, was enticed away from the home of Mr. Macklin and night after night the boys would smear his head and face with phosphorescent paste and then turn him loose on the streets. So many complaints were made to the police by the number of children frightened by the “ghost dog” that officers were sent out to hunt the animal. The climax came last night, when a neighbor of Mr. Macklin reported that his six-year-old daughter had been thrown into convulsions by the sight of the animal. The officers hurried out after the dog and shot him. They are now looking for the boys who painted him. The phosphorescent paste most readily available was probably rat poison, in which case the poor creature might have been doomed anyway: physicians reporting on human cases from the same period found that poisoning ensued from application of the paste to the skin. An ingenious boy, that Hermann McInturf. One wonders what his next trick would have been? Putting venomous snakes through his neighbors’ transoms, no doubt I have not found what disposition, if any, the magistrate made of him. Other examples of disguised dogs terrorizing the local populace? Or the ultimate fate of Master McInturf? Wipe off the foul slime of the huge morass before sending to chriswooodyard8 AT gmail.com.